When storms hit the St. Charles, Illinois area , the heavy rains and intense winds can be quite severe, causing some basements to flood. Add the problems that come from melting snow and ice at the end of the winter, and it's no wonder that so many homeowners struggle with flooded basements. Sump pumps provide a line of defense against these natural problems as well as flooding that occurs when pipes burst. 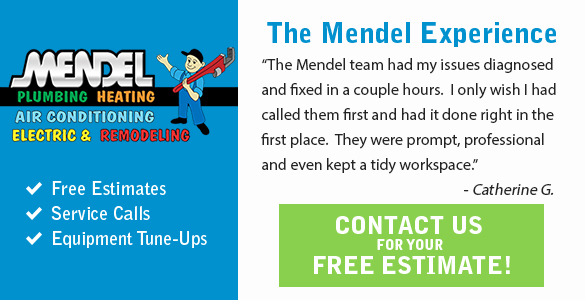 If you need sump pump services in St. Charles, consider Mendel Plumbing & Heating. Since 1985, we have been providing reputable maintenance, repair and installation for sump pumps throughout the Fox Valley region. Sump pump installation is not a DIY project. Unfortunately, mistakes in installing a sump pump can lead to expensive problems when the basement floods. From preparing the sump pit, which requires construction knowledge, to ensuring emergency power is properly in place, you need the services of a professional sump pump installation company. As part of Mendel's commitment to offering comprehensive plumbing and heating services , we are pleased to offer sump pump installation services. Checking the primary system and battery back up systems to verify they are operating correctly. Removing dirt and debris from the sump pit, then running water through to remove any accumulations. Repairing any problems we see to ensure that the system continues to function well. Cleaning the system to protect it from damage. A sump pump is something it's easy to forget about, until it is needed. Sump pumps run on power, and unfortunately, when stormy weather hits, power outages often occur. That's why Mendel Plumbing & Heating recommends a backup power source. With a battery backup, your sump pump will have power, even if power is cut to your home. Our plumbing professionals can help you determine which type of backup power is right for your needs. For homeowners in the Fox Valley area, including the communities of St. Charles, Geneva, Batavia, North Aurora and South Elgin, Mendel Plumbing & Heating is the best choice for sump pump service and repair. With a team of mechanical technicians with more than 100 years of combined experience, Mendel provides accurate service and exceptional customer service . We strive to guarantee that our customers are fully satisfied, and back our work with a one-year guarantee. Contact Mendel today to discuss your sump pump needs by calling (630) 377-3608, or fill out our online form for a free estimate.